Mark Mueller is a well-known artist throughout the state of Wisconsin. 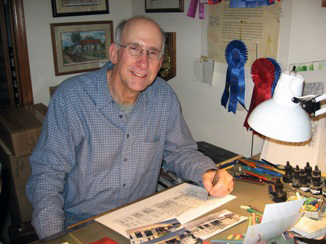 He is committed to portraying the nature and character of many unique buildings and landscapes in his limited edition pen and ink drawings. The pen and ink medium provides crispness and contrast to the scene. Then, each drawing is individually hand colored with pastels; creating an original piece of art in every image with natural softness and personality of its own. Mark's artwork fosters a pleasant sense of reminiscence. It touches the personal roots of American life, pleasing people of all ages. "The scenes I draw provide a glimpse of the past", reflects the artist. Mark's drawings embrace a broad subject matter, most prominent is country or lake scenes that foster a warm sense of memory. Mark has a particular interest and appreciation for everyday lifestyles. Mark has been involved in the art field throughout his life. He has a Bachelor of Science degree in Art Education from the University of Wisconsin- Stout. Mark has been exhibiting his award-winning art in shows since 1976. He has been presented with Purchase Awards and Honorable Mentions, among other recognitions, at numerous art shows. Mark has also been bestowed with the "Mayor's Choice Award" in Madison, WI. In the past, Governor Thompson purchased Mark's drawings as gifts for visiting dignitaries. Marks's drawings are also on display in the Waukesha County Courthouse and the City-County Building in Madison, WI. Mark attends numerous art shows throughout the course of a year. Some of his regular shows include: Mt. Mary Starving Artist, Madison Off the Square, Racine Starving Artist, Art in the Park Appleton, Elm Grove Art Fair, Cedarburg Fall Fest, Kenosha Art Show, Art in the Part Lake Geneva, Spring Green Art Fair, and the Sister Bay Fall Festival.